The Walton & Weybridge Film Society is one of the oldest film societies in the UK. readily available at that time outside the West End of London. 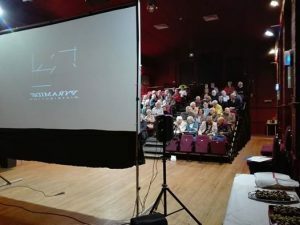 Screen at Walton, which offered higher standards of comfort, projection and sound equipment. Membership was capped at 155, and there was a waiting list. moved to the current venue at the Cecil Hepworth Playhouse, Walton-on- Thames. (very soon) the new season for films for 2017/18. Our Film Society meets at the performance hall at the Cecil Hepworth Playhouse, Walton-on-Thames, usually commencing at 8pm (times shown on programme page).